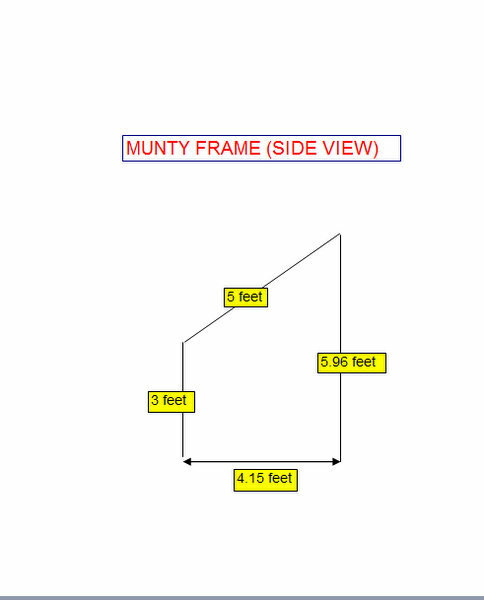 This thread is a discussion about Munty's Bean frame. This is the basic design structure. The plants have not reached the top of the frame yet as the vertical plus diagonal length must be about 9 ft. 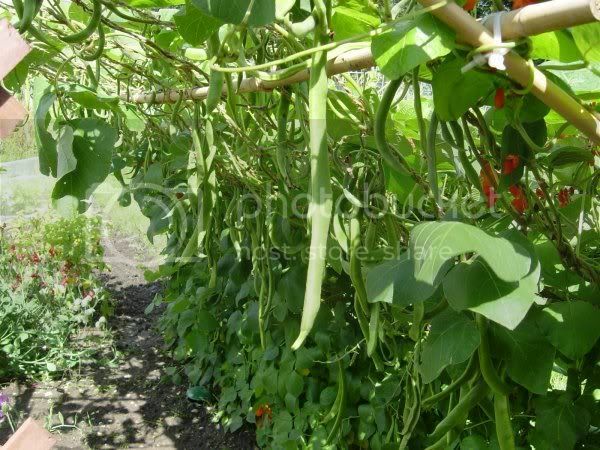 The beans dangle down and are very easy to find for picking. You can't see from these pictures but the plants are flowering very heavily. 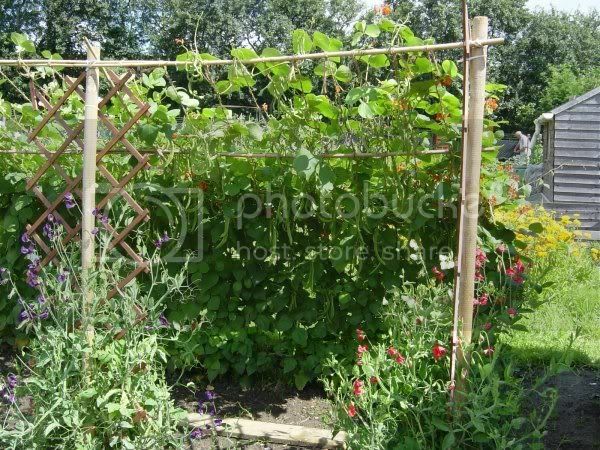 My brother put some of those 2in thick poles up for my mothers beans one at each end and one across like a football goal and then put a net from the ground up and over the horizontal bar and back to the ground but the weight of the bean plants, presumably, broke the bar. 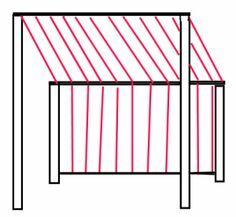 Could one use net instead of string for constructing one of the types described here or would the weight again be too much for the standard pea/bean netting. That looks incredible. I can't wait to build one next year. Did you use bamboo canes in the horizontal and proper posts (i mean proper wood) for the vertical to make it a permant fixture? Look fab I am jelous I didn't get one made this year! I used thick wooden stakes for the uprights driven into the ground. I completed the basic frame with bamboo canes (as you can see in the photo of me constructing it) lashed together with cable ties. 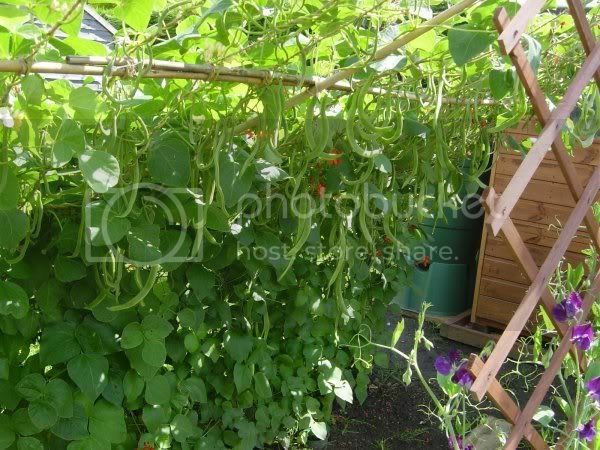 I then tied hop string on for the beans to climb. Two questions from me as a newcomer this year planning for the next year! Firstly, can I grow peas using this method? Secondly, I need to grow most things in containers and only have one small bed in the ground that I can use. Can the method be adapted to using containers instead of the ground??? The bed I do have is long (ish) and thin, and unfortunately the north and south facing means that the length of the planted row would actually be the thin part (about mower and half width). Do you reckon that is too thin, or should I try and adapt using containers on the paved area? Thanks for that! Will try out peas ( no one in my family like beans but I loved the frame idea and felt so left out that I thought I could do peas instead ). Will try to work out a smaller version using containers. How deep do you reckon and how many to a pot? I am thinking 2, maybe too many or not enough???!! 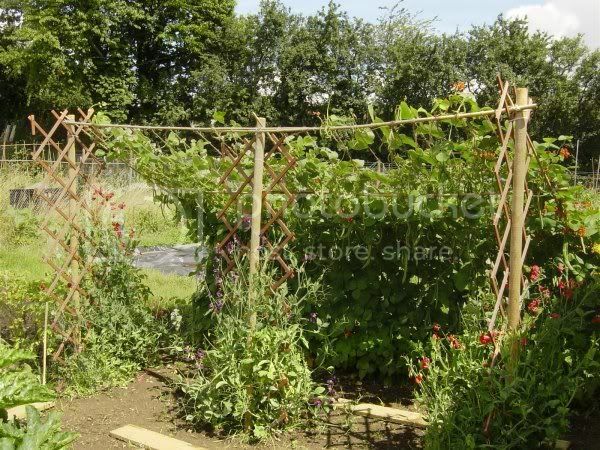 Bringing this back to life again - where Aunty had put trellises for Sweet Peas, could they be used for dwarf/French beans? Spanish soil makes banging canes in tough so it's a must to have good solid supportr posts every two metres and guy ropes. Munty - I have tried to do the canes as you said but being a girly 8 stone weakling I can't get the canes in deep enough - the soil is clay on the lottie( but it has just been rotovated again) I have even tried making the holes by hammering a shorter cane in and it still doesn't work - any suggestions? Rather than canes, which can bend and even snap when trying to force into clay sub-soil, I prefer to use round steel rods. 8mm diameter will do for shorter supports, 10mm will do for longer and 12mm is resilient stuff altogether. I have some luxurious 16mm dia' ones, sawn at 8 foot each. Being careful, you can usually force/twist the ends into most ground and can apply a hammer carefully to the tops in a way that you cannot with bamboo cane. Have the top ends bent right over and back on themselves for safety - only a couple of inches so they look like a mini shepherd's crook. Closely hammered and this forms a useful top loop as well for string and such. The ultimate is to have tiny 'arms' (say 2" of 6mm round bar) welded every foot or so (pointing up@ 45 degrees) along the above-soil length, for tying to and stopping string slippage down the rod. There's no need to paint them in my view. They'll last years and when rusted look ok in any case - Rustic in fact. Just plain black mild steel bar will do. Any local wrought-iron gate and fence manufacturer will have loads of it. All the sizes I quoted above comes in 6 metre nominal lengths, usually a bit more for cut-off bad end allowance and such. In other words (in old money) more or less 20 foot lengths. So you can get 3 x 6' 6" lengths (in fact 2 metres - doh) out of a full bar, or 4 x 5' lengths or even 5 x 4' lengths. Or 2 x 8 footers and a 4 footer. Just ask the supplier to cut a length equally into however you want it - you're not fussy enough to an inch or so. Have him bash the ends over - it's 30 seconds each with a vice and an anvil. And a decent hammer of course. Current prices should be about 5 or 6 quid per 6m bar for 12mm round, say 4 quid for 10mm and 2 or 3 quid for 8mm. If they set the saw blade at 45 degrees too when cutting the base ends, you get a fairly sharp point (in fact a deadly one) to enter the ground even easier.